The number of applications for foreign language degrees has plummeted in the last decade, figures show. Applications for both European and non-European language degree courses have fallen, according to an analysis of Ucas data carried out by the Press Association. While girls are still around twice as likely to want to study languages at university as boys, there has been a significant drop-off for both sexes. Experts said the decreases are concerning and that the UK needs to “nurture a new generation of fluent speakers”. The Press Association’s analysis shows there were 17,505 applications to study European languages, literature and related courses last year, down 30% from 24,895 in 2007. 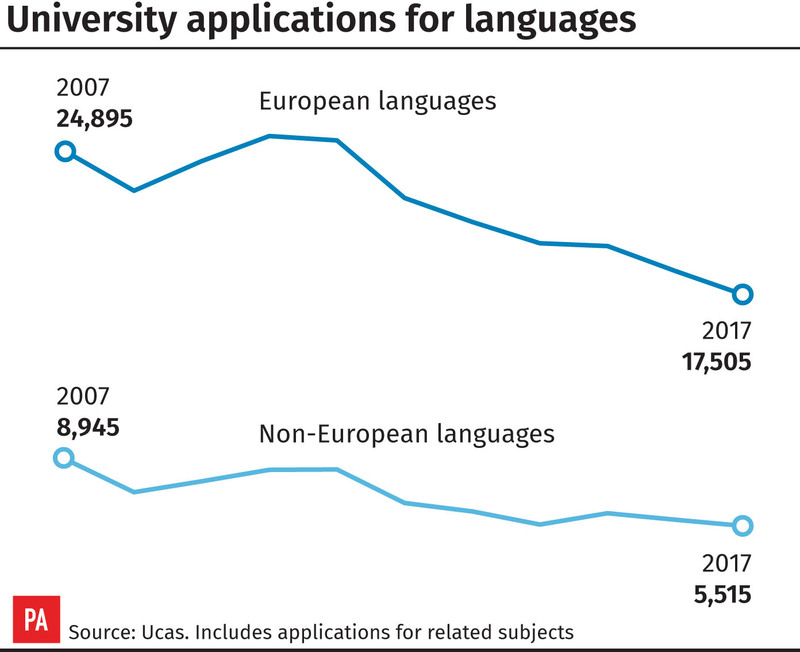 And applications for non-European languages, literature and related degrees have dropped by 38% to 5,515 last year – compared with 8,945 a decade ago. The analysis looked at all applications made through Ucas’s main application scheme between 2007 and 2017. The figures come just days before teenagers across England, Wales and Northern Ireland learn their A-level results. A gender breakdown shows that applications from boys to study European language courses have dropped by 27%, while for non-European languages the numbers are down 50%. Among girls, applications have fallen by 31% for both European and non-European languages. Mark Herbert, director of schools and skills at the British Council, said: “At a time when the UK is looking to forge new relationships around the world, it’s concerning that the number of young people applying for language degrees is actually declining. “We need to nurture a new generation of fluent speakers, particularly in important languages such as Spanish, Mandarin, Arabic, French and German, which our analysis shows will be crucial for the UK’s success post-Brexit. Ignacio Peyro, director of the Instituto Cervantes in London, said: “While we continue to see a drop in other languages, Spanish continues to maintain its popularity at university because it’s a language that many students can engage with socially and culturally. “It’s really important that young Brits are encouraged to study a language other than English, particularly as their European counterparts are already learning two languages or more from an early age.